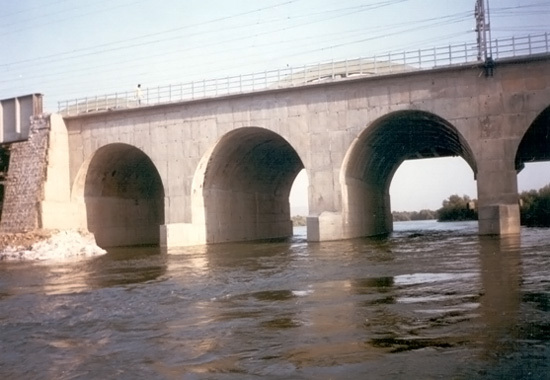 Details:	There are 2 prestressed bridges spanning the Cauvery River with 47 spans in all. 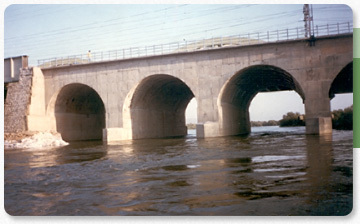 The existing superstructure consisted of two prestressed concrete girders spaced 1.2 meter apart with RCC decking on top. Challenge:	These bridges were to be converted from Meter Gauge to Broad Gauge track. Solution:	A full scale model test was performed on 2 released girders with RDSO, Lucknow. The tests were performed upto the ultimate capacity requirement of RBG loading according to the Indian Railway – Concrete Bridge Code. The prestressed concrete girders were strengthened by providing external post-tensioning and by increasing the thickness of the slab. Freyssinet 12 (phi) 5 tendons were used externally and were anchored at the end of the span.